This is a half scalping system that analyzes the market using a transmission function and price movement speed. This Expert Advisor is intended for trading on EURUSD, however it can run on other currency pairs. Please use the M1 timeframe. 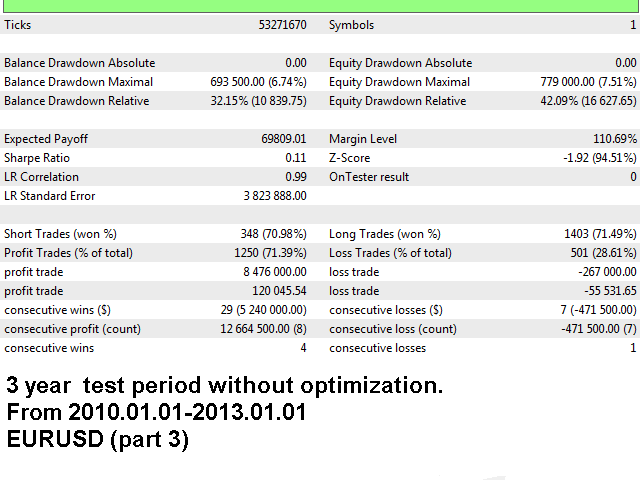 You should optimize only two parameters: Seconds_to_move and TradePrice. It is sufficient to optimize Bobra Adept only once, for example, for a half year period. After that, Bobra Adept shows good results on a forward period (or backward in my case). This can be observed on the screenshots. The EA has not been optimized for GBPUSD, since testing results were good without the optimization. Mode_Trade - pending or market orders. Magic - a magic number for the EA. UseManualLot - if false, the lot is chosen automatically. Lot - lot, 0.1 on default. 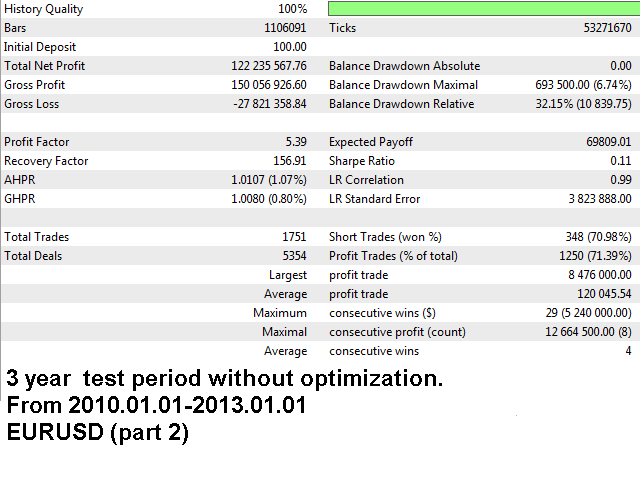 Risk_for_AutomaticLot - 30, the lot is chosen automatically on the basis of the balance. MaxSpread - maximum spread, with which the EA trades. Safety_mode - if true, you are saved from the majority of losing trades. Safety_sec - use no less than 5, better 5-10. Safe_coef - 0.7 (max = 1). If 1, you will earn more on sharp price movements. exp_pending - 30, pending orders' expiration time (in seconds). level1 - a distance between the first pending order in the grid (opened upon a signal). Max_orders - the maximum number of orders in the grid. Dynamic_SL - true, the stop loss will be dynamic depending on the spread. Virtual orders also become dynamic. slippage - 3, maximum slippage. TakeProfit - 50, distance to fix profit. Stoploss - 5, distance to fix loss. VirtTakeProfit - 50, distance to fix profit. VirtStoploss - 5, distance to fix loss. VirtStarttrail - 3, trailing starts when price reaches this value. VirtTrailingStop - 3, a distance, at which the Stop Loss will be trailed following the current price but only if the positions are profitable. Automatic detections of the quotes precision. It considers the peculiarities of Market Execution (stop levels can be changed after opening the position). It shows good results on forward periods. The settings have been selected for live trading, but your results will depend on your broker's spread and quality of order execution. Please write a private message to me, I will give you recommendations on how to trade on a live account: live settings and information about decent brokers, etc. I stopped run this EA. I had big DD and I gave up . This EA can make an abnormal good performance but you have to invest a lot of time to find a well working setup. If Arnold bring out an update old sets are often trash. So you have to start from the beginning. Money Managmant is a big toppic. For my feeling it´s also with hedge not perfect. If you have a good PC/Server and time you will get a nice ea. On main events you have to stop the ea manually. I`m sorry to give bobra stable another 1 star rating. After testing it for one month I wouldn't recommend my friends to buy this EA in this stage of development (oct'16). There is a relevant weak point in risk management: one painful big loss has wiped out 50%(!) of my account in only 1(!) night. I confirm the ratings of other users in last months and hope this crucial problem can be fixed by a complete revision. I start using this EA in march and make some profit. In april was a big drawdawn, just in one week -70% loss. After 2 weeks using new version 7.5 makes EA no profit for me. I hope Arnold will not give up and make his EA profitable and secure. Yes it is very STABLE EA. It produces STABLE LOSSES. Scam! I think the other comments here also scam like "It works perfectly.." and bla bla. The provider has deleted the corresponding signal from mql5.com after the signal has crashed. Доброго времени суток, уважаемые покупатели будущие, и те что уже приобрели этот продукт Bobra Sable! Я лично хочу порекомендовать данного эксперта для торговли на реальном рынке форекс. За время использования эксперта с новой стратегией, он зарекомендовал себя как стабильный и прибыльный робот. Горизонт инвестирования хотя бы полгода, при минимальных рисках, но вы также можете использовать его для разгона депозита. Лично я начал торговать с 30$ что вполне достаточно. Как и у любой стратегии бывают неблагоприятные периоды, которые робот проходит успешно, не теряя почти ни чего, или потери сводятся к минимуму. Я хочу поблагодарить Арнольда за его труд, и отзывчивость. За то что он дает возможность заработать и другим, естественно за разумную плату. Хочу сказать что у данного эксперта, появились ненавистники (в том числе люди которые отлично знают русский язык и не умеют расставлять запятые), которые считают, что все мы покупатели данного робота, в сговоре против них! Не обращайте внимания на тот негатив который они пытаются распространять. После обновления робота, он успешно работает и зарабатывает! Подтверждением моих слов является не один реальный счет, а большое их количество, достаточно обратится к любому покупателю и я уверен любой поделится с вами опытом торговли данным экспертом. Отдельное слово всем тем кто пытается подорвать репутацию автора и его робота, просто завидуйте молча. Вы сами сделать не чего не можете, так порадуйтесь за успех других!!! It's a good EA, it works perfectly. Здравствуйте, новая версия действительно хороши, пока он работает отлично, надеюсь и дольше будет и так. I have started with 250$ on my account and ended up with about 1200$, Bobra stable is an excellent EA with a lot of potential.. With good settings, you will be surprised how good it is..
Edit: Only worked on the first month I bought it, since then it only losses money and barely do any profitable trades, no matter if I use the set I used in the first month or a new set that's provided by Arnold. Очень хороший робот по моему, поставил не так давно на реал, просадок практически не бывает, а прибыль очень даже хорошая. Поддержка тоже на высоте, автор отвечает на все вопросы очень быстро и высылает новые настройки когда появляются. При правильном подборе брокера и настроек работает стабильно. Торгует хорошо на паре EurUsd tm1-tm5. Хорошая работа и качественная поддержка! сначала были сомнения по поводу робота так как долго не торговал дале пошла жара, плохо работает на счетах ецн и фиксирований спред. Хорошая работа и качественная поддержка! Всем профитов Автору большое Спасибо! I should say the developer is very helpful and he will answer all your questions. This is a profitable EA, but you need to pay attention to 2 points: 1, use a good broker, because not all brokers can profitable by this EA. You have to test for month with your broker. 2, To be patient. There will be only few trades in one month. Рабочая программа. Как уже писалось предыдущим автором: в "плохом" для себя рынке минусует мало(-5% депо за 3 месяца вялотекущего флэта), а когда пошли события и движения первой сделкой перекрывает затянувшийся флэтовый период(+15% на вчерашних новостях по евро-ставке). p.s. после покупки сразу же пообщайтесь с разработчиком, т.к. перед работой на реальном счете надо установить "правильные" настройки робота. New version much better than first release. Produces a few small losses and very big wins. Advisable to use a fix spread broker. it works on a live account with a pending mode, and much better then old version. advanced_stops - this feature can provide partial close. Upgrade of easy_setup (new strategy). - Speed_out = true. EA exits trades by timer. - delta = 0. Breakeven by timer. - Liquid_mode = true. Increase position size using market orders (if true, set Maxorders to 1). - Addpercent = 3. Percentage for increasing positions. - liqMaxSpread = 3. Maximum spread for increasing positions. - Added Magic parameter (usual magic instead of automatic one). - Added Safety_mode parameter (just make it = true). - Added both_directions == true (EA opens grid in two directions). - Added "level1" parameter - distance to the first pending order in a grid (that open by a signal). Changed auto lot size calculation. Added one of the feature of Bobra Adept. Fixed bugs with the tester.